Chicken pizza recipes can range from BBQ to Chicken Alfredo. This chicken Waldorf pizza is a special recipe that combines the classic apple salad with a pizza crust. There are so many chicken pizza that you can try and experiment with, but this one really spoke to my heart. 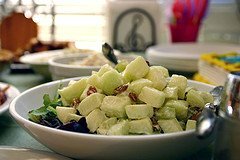 My grandmother used to make waldorf salad (not the pizza, just the salad) and it's one of my favorite salads. The combination of apples, walnuts and chicken is so tasty. I came across this chicken waldorf pizza recipe and was so excited. 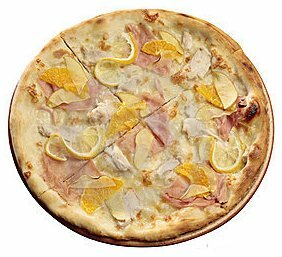 It's a nice, refreshing pizza that is ideal as a lunch or appetizer at a party. This recipe called for almonds, but I prefer walnuts. Waldorf salad is usually quite chunky as you can see in the picture above. Be sure and chop your apple into small chunks or thin slices since you're topping a crust with this salad. Heat oven to 425F. Lightly spray 14-inch pizza pan with nonstick cooking spray. Unroll dough; place in sprayed pan. Starting at center, press dough out with hands to edge of pan. Bake at 425 F for 6 to 8 minutes or until crust begins to brown. In medium bowl, mix chicken, apple, almonds, mayonnaise, salt and pepper. Return to oven; bake an additional 10 to 12 minutes or until cheese is melted and crust is deep golden brown. Sprinkle with green onions. NOTE: You can also use a Boboli pre-made crust to make this recipe extra simple. You do not need to pre-bake a Boboli, just place ingredients on crust and bake at 450F for approx. 14 minutes or until golden brown. Enjoy your chicken pizza recipes!